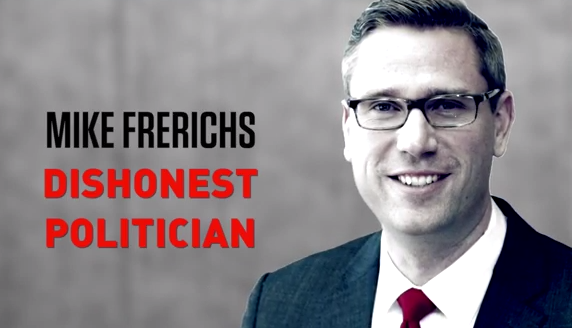 It is well documented that Democrat Mike Frerichs had the worst.campaign rollout.ever in Illinois history. See our post here for background on his campaign where he proudly proclaimed his accomplishments only to have to recant them the next day because THEY WERE LIES. Now, a day after Governor Pat Quinn announces his push to raise taxes on Illinois, Mike Frerichs wants us to believe him about the things he's saying about his opponent Tom Cross. In what has become his signature "Breathless" style of campaigning where everything feels like he is coming from his mouth in a 'squeal-like tone', he publishes a long-winded press release where he tries to tie his opponent to some stuff. The problem? We can't get past the terrible spacing and type problems. Let alone...can anyone believe Mike Frerichs anyway? His staff clearly isn't checking things. From his 'immediate' press release we find this glorious mistake. Guess we should just add it to the pile of Frerichs for Illinois mistakes, right?